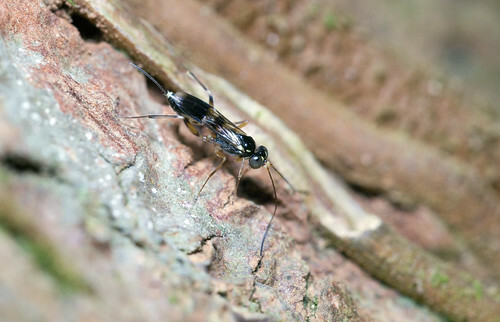 Forelegs raised, with white socks that mimic the twitchy flagellomeres of stinging insects, and commanding a level blade on which individuals, or up to three interested parties, parade and attempt to pair up, micropezids offer an accessible doorway to the world of tropical entomology, a field where infinite avenues for exploration lurk behind a wall of niggling gaps. 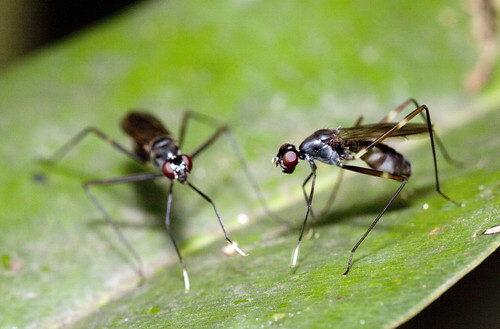 For visitors who want a touch of nature but only in flavours that are artificial and wholly alien to native woods, stilt-legged flies pose imaginary threats from their posts on low vegetation by trails through forests that face a palpable risk of destruction through neglect and a notion of progress rooted in numbers. Though conspicuous and fairly common, even in trails that suffer from indifferent users and abusive runs, micropezids betray few of their secrets to casual observers. The most abundant poser, probably a species of Mimegralla, is a creature that wrecks the mental image of dipterans harboured by garden-variety naturalists; in habitus, it mirrors lanky and leggy wasps in the family Ichneumonidae, some of which are known to inflict nasty stings, and thus courts and couples with relative impunity. 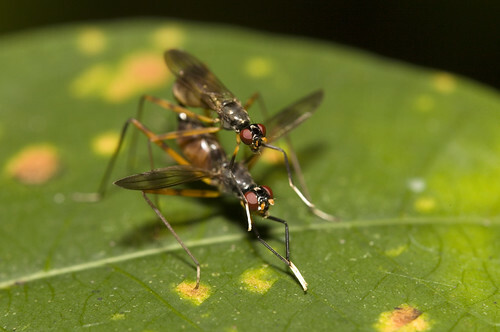 Pairs in copula – the male atop his mate and the latter with her wings spread out to accomodate the straddler, to whom she is secured by a sternal grip – provide a primer to the facts of life and the faces of dipterans with the power to offend urban sensibilities and arouse parental ire. Paths near forest streams and mangroves are frequented by another, possibly congeneric, micropezid with darker tones and duller eyes. A smaller, paler species is sometimes encountered on broad-leafed herbs such as Alocasia, while an unidentified orange-brown member of the family has been observed in the vicinity of weaver ants on a saline fern. Accounts of feeding behaviour are scarce, but micropezids are reported to consume aphids and smaller flies. Some are drawn to carrion, dung or decaying fruit, but it is unclear if these items serve as primary sources of nourishment, supplementary nutrition or magnets for prey. What little is known about the maggots is that they dwell within the rhizomes of wild gingers, under the bark of dead trees or in burrows made by other insects. Micropezids have a distinctive poise as well as notable proportions; their mid and hind legs are spindly but the forelegs are far shorter and function more often as bluffs than limbs. 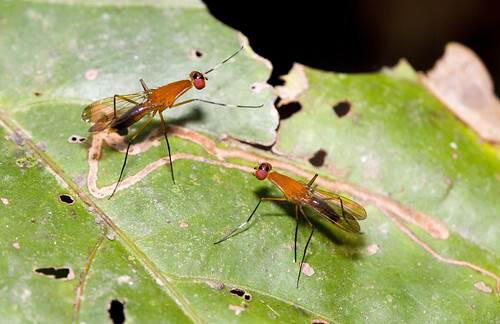 Thus, two slender flies that pranced about on a leaf by a stream in Sabah's Danum Valley, their wings held at an angle, were initially taken to be stilt walkers, albeit of an exotic bent. The similarity was reinforced by the outstretched forelegs of one animal, which also bore white portions typical of sham hymenopterans. Douglas Yanega of University of California, Riverside, pointed out, however, that these were not "crummy old micropezids" but curiosities from a "much more interesting" group: Nothybidae, a monogeneric family with just nine or so species, and one of the few families of true flies endemic to Southeast Asia. One species, Nothybus longithorax, is known from Borneo. The mistake was not new, for some earlier dipterists had also tossed Nothybus under the micropezid bus. A more careful examination of the insects revealed crucial differences: the middle pair of legs are markedly shorter than the other two and all three sets of limbs appear to emerge from a common base set far back from the head, an impression created by a particularly elongate thorax with an arch-like precoxal bridge. One of the two was engaged in a persistent effort to woo the other, although his repeated attempts to mount her were rebuffed. 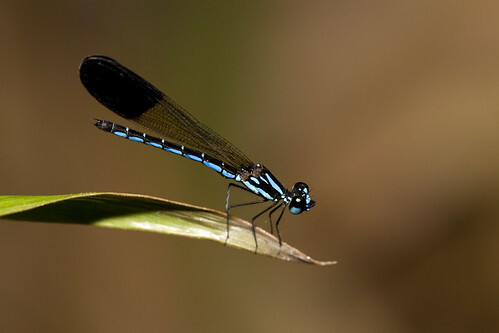 Their habitat was a meagre stream, more of a trickle, in primary forest that received thin bursts of sunlight early in the afternoon, by which stenotopic odonates – platystictids, threadtails and spreadwings – were sought. The only damselfly present was a common chlorocyphid, Rhinocypha humeralis, so attention was diverted to the flies as they conducted their pas de deux to the calls of Bornean gibbons and helmeted hornbills. As with these charismatic megafaunæ, Nothybus thrives only in unlogged forests, where the crowns are dense and the understorey humid. But like many other small or spineless things occupying nodes in the web that sustains life under evergreen canopies, nothybids and other neglected branches on the tree of knowledge remain near-cyphers, midgets of mystery with little to hide but the grubs in their guts and a gulf of missing links. I'm writing a scientific paper revising the species of Nothybus (Nothybiidae), and I would love to use your photo in it. You would of course receive full credit. It would be a wonderful addition so the paper so I hope I hear back from you! Talk to you soon.